Kyon is just an ordinary student living an ordinary life at an ordinary high school. So is Haruhi. That's the problem: ordinary isn't good enough for her. 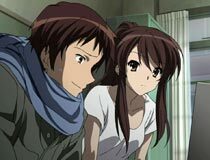 Most students avoid Haruhi due to her brash personality, but being kind of cute; Kyon tries to talk to her from time to time. And fails. Or so he thought. 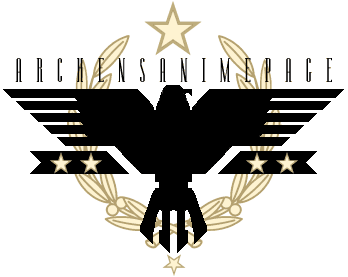 Haruhi decides to form a club called the SOS Brigade, which will search out strange and "un-boring" things like ESPers, time travelers, aliens, that kind of thing. Kyon is inducted as the first member, and he doesn't seem to have a choice in the matter. Haruhi cobbles together enough oddballs to bring the head count to the minimum requirements for a school club. All that's left is to find something interesting. Yet no matter how hard Haruhi looks, there's nothing unusual to be found. Kyon on the other hand, discovers the universe is even more crazy than anything even Haruhi could come up with... almost. When it came out, the Melancholy of Haruhi Shizumia swept through the anime scene like wildfire. 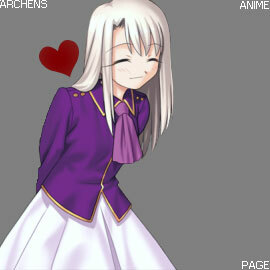 It has nice artwork, and some fan service (but not too much). It's also fun with intelligence - two things you'd think are mutually exclusive watching today's anime, but work well together in Haruhi. It's not a perfect show, and tries too hard to be appealing, but otherwise has a good balance of entertainment without becoming pandering garbage. There is a philosophical question that has been asked through the ages regarding the universe. Could our reality simply be a dream? The simple answer is that it's impossible to tell, so therefore it doesn't matter. But what if reality really did depend on the imagination of a person. And that person wasn't you. And what if the fate of existence depended on the whims of the craziest girl you ever met who sits next to you in class. If you ignore her, the world might end. If you provide her sufficient amusement the universe may keep going for another day... if you can survive the insanity. The Melancholy of Haruhi has a great setup because it's as deep and philosophical as you want it to be. It's easy to enjoy without thinking too much, and it still makes perfect sense. The more deeply you think about the show and the characters, the more interesting it becomes. It's rare to hit that sweet spot with a topic. 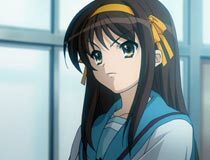 As an aside, I've actually known girls like Haruhi, and every guy who ever dated that girl had their lives turn into a disaster. Consider that a public service announcement from AAP. The characters are well constructed for what they do. 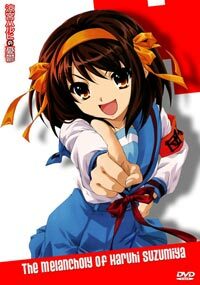 On one side is crazy girl Haruhi. Every day with her is an adventure, and she's wants life as exciting as possible. The counter point to Haruhi is the analyitcal, grounded and slighlty cyinical Kyon. Taken separately either character would be annoying, but as a pair they make a great team in how they play off each other. Sandwiched between them are the other members of the SOS Brigade. What makes the characters in this anime aren't the individuals, it's the way they compliment each other and the story. Production, art, animation - they're all very good. The dub is well produced too. I had it in my mind that the English voice actress for Haruhi was doomed to fail, but Wendee Lee proves me wrong and does a great job capturing Haruhi's energy without being annoying. (That's a tough balance) The story is adventure of the week format. Nothing in an overall plot is revealed, it just follows the troupe of the SOS Brigade. Which is fun (and smart) enough to make it worth watching. Some warnings about this one: Episodes were broadcast out of chronological order. This causes continuity problems, but does feel more like season 1 reached a conclusion. Your choice in which is more important. There's a reason I'm breaking season 2 into a separate review. Season 2 is a unique anime phenomenon where an anime studio basically trolls all of anime fandom. Which would be hilarious, except they did it with a great series you want to see more of and deserves better. The good news is that it gets redeemed with the final movie. The first season of the Melancholy of Haruhi Shizumia hits most of the strengths of anime. Easily one of the better anime titles of the 2000s, and certainly worth watching. Haruhi: I don't know how I know, I just know that I know, you know?